Jenna is still looking for this blankie. I’m looking for a light blue 15 inch square Target super soft bear blankie. It has a slightly darker blue satin edging and lining. The head is approximately 3 inches in diameter at its widest point. It has white centers in its ears, with a white muzzle and blue stitched eyes, nose and mouth. The hands are joined together, but it is not holding or clutching anything. It is very plain and simple, but is worth more than gold to my son. The back of the label is so faint. It may say 48274700 or 46274700 but I cannot be sure! The front of the label has the Target circles with Made in China. 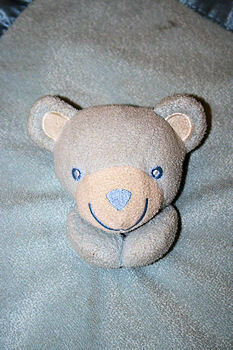 My son, Rex, received this blue bear security blanket as a gift when he was born. He is now 2 and is more than very attached to this blanket. He does everything with it- drinks milk, sleeps, rides bikes, watches movies etc. — he loves it so much! There has been the odd occasion where I have not been able to find it for a day or night, and the consequence of this was a very unhappy, disrupted, sleepless child. So now I am very conscious of knowing its every move and trying to preserve it from rolling in the dirt and smothering in food, as every time I wash it, it feathers and wears even more. I know it is not going to last forever and would love a backup blanket (or 2) in the event that it gets lost permanently or does not survive the wash. I have been in contact with Target Australia and USA with little response other than to say that it has been discontinued, and that they have comparable ones available. Little do they know that I have tried “comparable ones” only for them to be thrown across the room time and time again. It has to be identical feel, color, size, touch and even smell. It is the only thing that comforts him in his time of need and makes him feel secure – hence the name security blanket. Even Mum’s cuddles do not compare to being able to clutch his Binkie and rub the satin edging. These chain stores should really think about the consequences of discontinuing an item like this, because it has caused major disrupt in my family. Regardless, I would be very grateful to anyone who may have this item lying around, and I would be able to give it a loving home. It may be one that someone has tried as a replacement blanket for another item that they have lost and their child never took to. It saddens me to think that there must be millions of these things in circulation, and that I cannot get my hands on the one thing that my son loves more than anything in the world. Thank you so much for any help you can give.